Chindon-Ya is a marching band work for such businesses as restaurants or pachinko to advertise them. The history of Chindon-Ya starts 1880’s when there were no big advertisement mediums like we have today. Chindon-Ya went downhill during wars but became popular again in 1950’s. There are still Chindon-Ya bands in Japan. Usually they dress kimono and hold Chindon drums with Japanese umbrella on their belly. 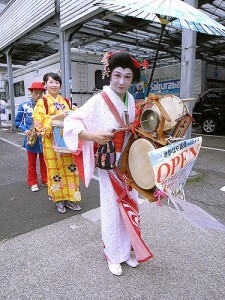 The performers’ kimonos are colorful and music they play is very cheerful!! Because they make people happy, they are asked to perform at festivals or hospitals today.